Make a paper lantern with free templates: simply print, cut & glue these paper lantern crafts and you're done. The lantern design does away with glued 'back' seams: The elegant closures are the seams, so these lanterns look great from every angle! Oh, and did I mention they also make nice printable gifts? Just cut out a paper lantern making kit, flat-pack and send off with gluing instructions. How to make a lantern: tips & tricks to design your own! a) Download & print the paper lantern craft pattern of your choice. In the finished paper lantern, the left and right edges of the paper overlap to give the printed closure a 'shadow backing' of the same size and shape. To prepare the shape, place the design face down & roll the sheet up from the short unprinted side, in the direction of the closure. Test the look: Correctly aligned, the printed design should have a paper 'shadow' of the same size and shape behind it. With the printed design face down, distribute glue along the short paper edge, making sure that all extruding bits have glue on them (as indicated above left, in blue). Carefully roll the paper up again. Check that the edges underneath line up with the printed design on top. Glue together once all sides are perfectly aligned. Design Your Own Paper Lantern Craft Pattern! The designs on this page were made using copyright-free stencils from a lovely little book by K. Prakash: 250 Stencil Designs from India (Dover Design Library). So how do you make a paper lantern from one of these designs? Scan or copy (if necessary, resize) a design/stencil - or draw your own! Print & cut out the design. Draw the upper and lower borders of your template. Copy the left border of the design to the left margin of your paper lantern template. 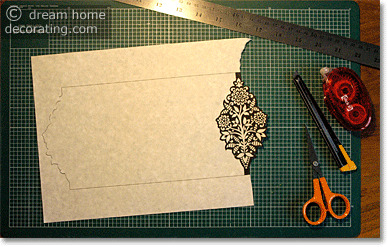 Print the finished template onto parchment. Cut out & glue together as described above! Download Your Paper Lantern Craft Patterns! 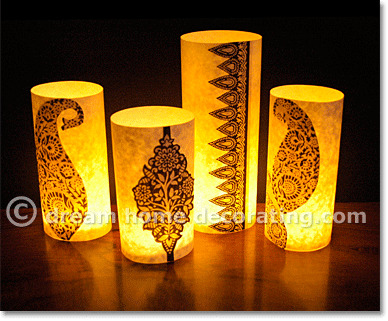 You will need Adobe Reader installed on your computer (the latest version is recommended) in order to open and print the paper lantern craft patterns. You can download Adobe Reader here (a new window will open so you can download it without leaving this page). If you want to open the files in your browser window, just click on the links. To download the files to view later, right-click on the links and choose "Save Target As" or "Save File As". Then select where you want to save the file on your hard drive. In order to print the pattern to make a paper lantern, open the downloaded file, and select the "Print" option from the menu.